This is the most aggressive and feared animals. Though dark in color, this leopard still has its rosettes (spots) of fur. Nearly always hunting at night and early morning, from the tree and the ground. This is the most aggressive and feared animals in the world. Pound for pound, the leopard is the most deadly animal in the world. They are capable of killing an animal up to 1200 pounds and then drag that animal up 30 feet into a tree, before eating its prey. 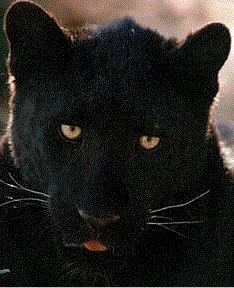 The black leopard is referred to as the "Panther", but there is actually no animal strictly known as a black panther. There are only two black cats in the world; the black leopard from Asia, and the black jaguar from South America. The word panther, derived from the Latin "Panthera" actually means cat, and is a nick name for any cat, or a black cat as well. Also, Panthera is the family name for all big cats. With the longest tail of the cat family, the leopard is some what of an acrobat. They can jump as high as 18 feet straight up in the air, 30 feet in a single leap, and move at speeds over 45 miles per hour. Reptiles, birds, small mammals, small to medium size ungulates, and occassionally small carnivores. 12 years (up to 20 years in captivity. Far East in China, stretching throughout southern Africa south of the Sahara. Parts of Arabia. Also a few scattered populations in north Africa. Occupying areas from 4-12 square miles (10-30 Sq. Km.) with overlapping boundaries with other leopards.